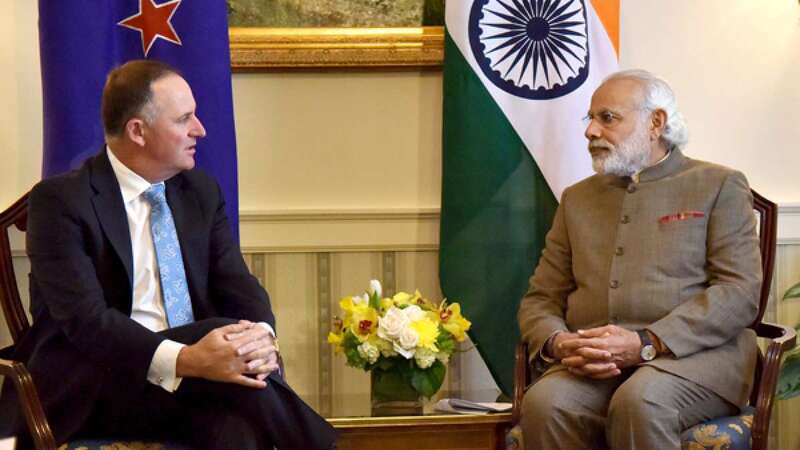 New Delhi : New Zealand Prime Minister John Key on Tuesday arrived in India on a three-day visit and will be holding talks with PM Narendra Modi on Wednesday. Prime Minister Narendra Modi will be seeking Wellington's support for India's entry into the Nuclear Suppliers Group (NSG). New Zealand was among the countries which claimed that no exception can be made in case of India, a non-NPT country, but considered its membership bid. Even with strong support like US, India failed to get the membership due to strong block created by China saying it was a not a signatory to the Nuclear Non- Proliferation Treaty. Ahead of Key's visit, External Affairs Ministry Spokesperson Vikas Swarup said that India will try to take New Zealand in confidence about being a potential country to a member of the Nuclear Suppliers Group. "We believe that we have all the credentials to be a member of the Nuclear Suppliers Group and we hope that at the end of the day the 48 member grouping will see the logic of India s entry because it will only strengthen the global non- proliferation regime," Swarup had said. Apart from Delhi, where Key will hold extensive talks with Modi on key bilateral issues and call on President Pranab Mukherjee, besides attending a business summit, he will also travel to Kochi on Thursday. John Key had last visited India in 2011.